Olga “Shookie” Nagle of Bradenton, Florida formerly of Parsippany, New Jersey passed away peacefully on September 5, 2018. Olga was born to Stella (Chorny) and Nils Karlson on June 19, 1939 in New York, New York. She later went on to graduate from Theodore Roosevelt High School, Bronx, NY in 1957. 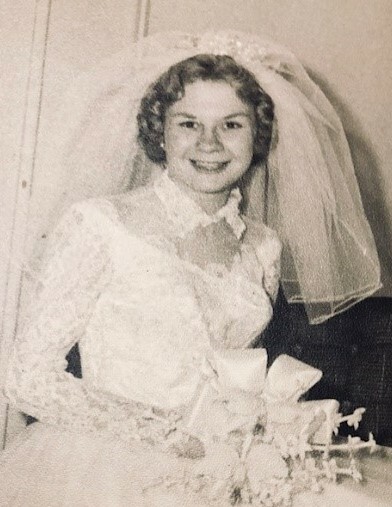 Olga married Garrett Francis Nagle on July 2, 1960. Olga and Garry raised their two children Christopher and Christine in the Bronx and later in Parsippany, NJ. Olga also cared for other loved ones in her home and worked selling Avon products while raising her family. In January 2015 Olga relocated to Bradenton, FL where she was well cared for by her son Christopher and the loving caretakers at Windsor Oaks and Hawthorne Village assisted living facilities. Olga is preceded in death by her husband Garry, parents Stella and Nils, brother Skip Karlson, and niece Elizabeth Karlson. She will be forever in the hearts of her son Christopher, his wife Cheryl and grandsons Ryan and Matthew of Bradenton, FL as well as of her daughter Christine Smith and her husband Steven of Lake Hopatcong, NJ. Olga will also live on in the hearts of her siblings Ellen Vargas and husband Jorge, John Hennings and wife Peggy, Peter Hennings, Carol Rafferty, and sister-in-law Judy Karlson. Olga will also be very lovingly remembered by her nieces and nephews Sylvia (Matt) Thomas, Kim (Joe) Seaman, Sarah (Rob) Notaro, Suzanne Hennings, Heather (Will) Rayfield, Corey (Renee) Hennings, Rob (Allie) Rafferty, and Erik Karlson as well as all her grand nieces and nephews. Olga enjoyed reading, movies, musicals, and traveling to New York to attend Broadway plays. Olga had an impressive collection of Norman Rockwell decorative plates that she proudly displayed in her home. Olga always had an incredibly warm, and loving personality that resonated with all those she encountered. She was a wonderful woman and will truly be missed by all. A memorial mass will be held on October 13, 2018 at 10:00 A.M. at St. Joseph Catholic Church, 3100 26th Street West, Bradenton, FL 34205.